Maybe it was that the ground was in such good condition, maybe it was that they had just played each other in a warm up match last week, or maybe there is some sort of Pacific pact? But the big hard body clashes we come to expect particularly from Nauru, (and make no mistake PNG are always up to match the tough stuff when it comes) were just not there in the amount we come to expect. Or maybe it is just that open play six goal opening quarter from PNG just took the sting out of Nauru? 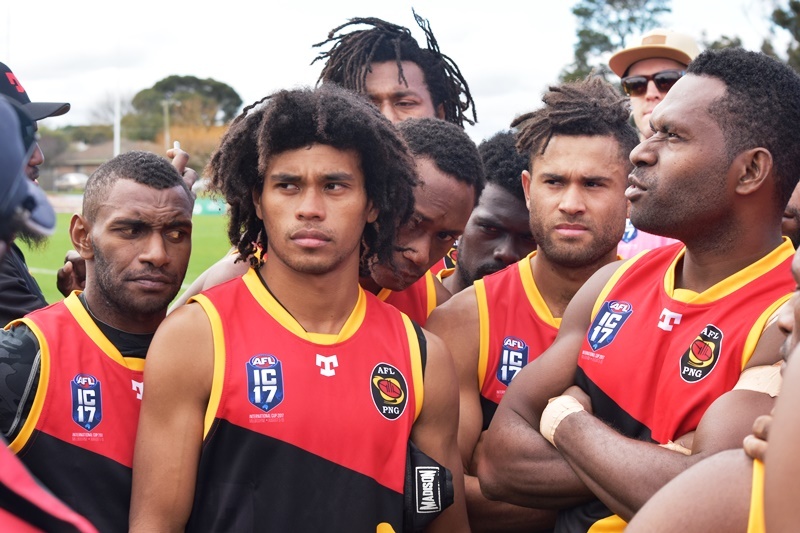 PNG are very aware that if they can play well enough and finish with a 3-1 record next Tuesday then they are still a chance to play in the Grand Final if their percentage is good enough. And so it was they burst out of the blocks at Sebastapol. Big John Ikupu looked good to go from the start at full forward, his first score a behind though. Kelly Kagula, not yet 17 got the ball rolling for PNG with a snap from the pocket. Further goals to King, two to Amua Pirika looking like the dominant forward he should be, Siwee and Savere adding one each. The delivery out of the middle was fast and accurate and the Nauru defenders were unable to focus on any particular target. Pirika kicked his third for the match early in the second quarter into a slight breeze after marking a high ball pretty much uncontested. Bronco Deidenang kicked Nauru's first goal of the match and was working hard along with Shawn Kemp Maaki to give their midfielders a target. Ikupu kicked his first as he was unmarked on a quick re-entry to the PNG 50. Laurie Logo was busy all match and also kicked his first after floating back with the flight into the 50 and almost took out Pirika, both players appeared to grab the ball, but Logo got the umpire's nod. 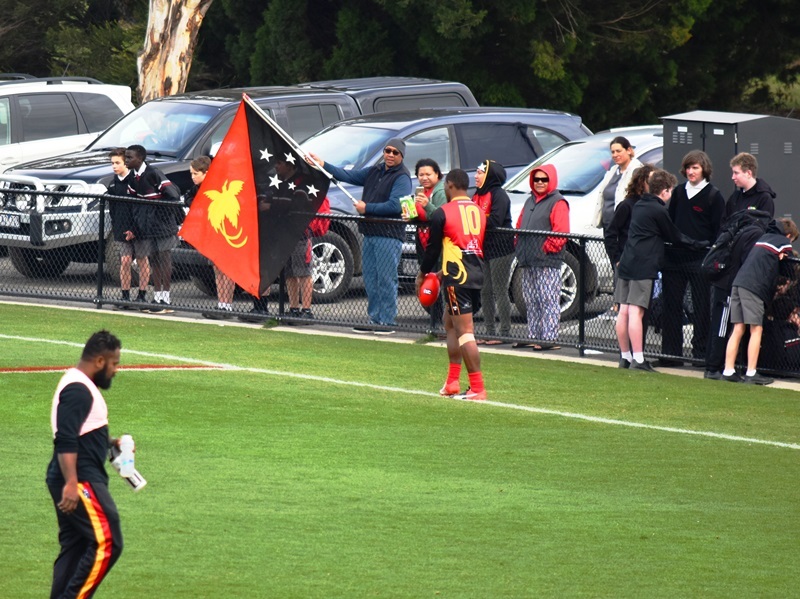 Joeson Kanimea added a second goal for the Chiefs and they also kicked three behinds for the quarter which they could not really afford to miss. PNG's Ikupu added his second before half time, using his size to protect the space and after a good leap landed and took the mark in his lap and kicking truly to give his side an 8 goal lead. While Nauru never really recovered from the first quarter they definitely were more competitive in the second half. Kenneth Oppenheimer, Devine Agir and Tian Waidabu all working hard to give the Chiefs some momentum even if it did not show on the scoreboard. Pirika kicked his fourth for the match and Brendan Beno got reward for his hard work around the ground with a goal of his own from 55m out after being on the end of two 25m penalties initially at half back. The only Nauru score for the quarter came from Maaki whose kick into the breeze hit the post. Nauru won the final quarter, after another behind to Maaki his tag team partner up forwards in Deidenang kicked one with the breeze from 50. Maaki kicked his second goal for the match late in the quarter. 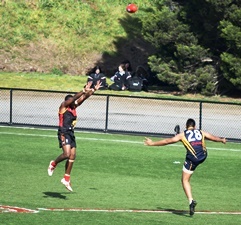 In response PNG added a behind from Beno and Siwee kicked his second goal for the match. The Mozzies running out 49-point winners. The battle between Nauru's Tatum and PNG's Clyde Puller was worth watching while Goroga and Logo were real livewires around the ground all match and gave PNG much of their drive. Oppenheimer worked hard through the middle of the ground all day for Nauru and won numerous contests. Also mentioning was Oea for PNG, he is not even 16 yet, but he played with men and as a man today - one to keep an eye on. 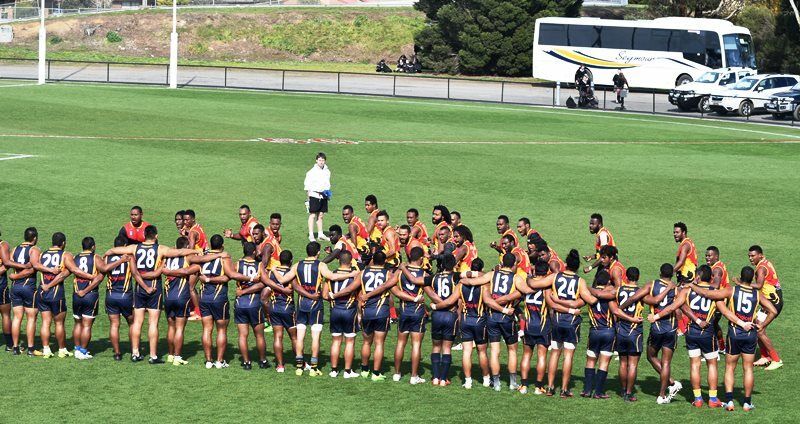 PNG now play the USA at Montrose on Saturday which will have big implications for both sides. Nauru will look to get onto the winners list in their match against France.